After 15 months of planning, the day had finally arrived: Alexa and Ben were getting married! 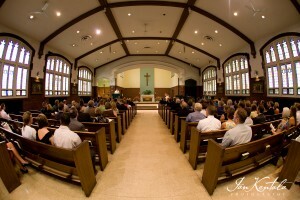 The couple chose to say their vows in Alexa’s church from college: St. Lawrence Catholic Church in Dinkytown near the University of Minnesota campus. After a terribly stormy evening the night before, we were all happily surprised to get to photograph them in non-rainy conditions. Alexa and Ben chose not to see each other beforehand, so we photographed the two, their bridesmaids/groomsmen and their families separately, then proceeded to snap all of the large groups and wedding party after the ceremony. Thankfully, we had plenty of time to get everything in—even an hour or so to take shots near St. Anthony Main and the Mississippi River in Minneapolis. Since Alexa is a dear friend of mine, this day was especially meaningful to me. I’ve known her and Ben throughout their courtship, and it’s been so fun to watch them grow as a couple. Being the second shooter, I spend most of the day catching the behind-the-scenes moments, so once all of the girls had left to line up for the processional, it was just me and Alexa for a few moments alone before she walked down the aisle. I looked at her and smiled, saying, “Well, it’s just me and you now. You ready to do this?” Of course, I quickly brought of us to tears. We wish the new Mr. and Mrs. Cushman all the best as they embark on this new chapter of their lives together. Congratulations and we can’t wait to show you the rest of the pictures! 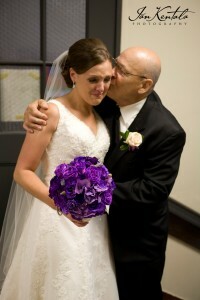 Alexa and her dad, Al, share a moment before they walk down the aisle. 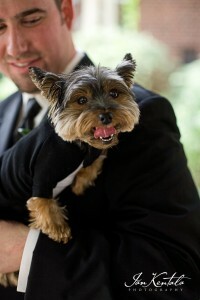 The couple's Yorkie, Cooper, served as an honorary groomsman. He's even wearing a tuxedo T-shirt! 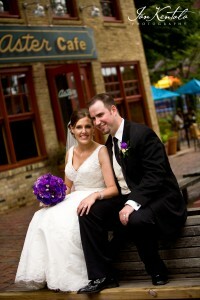 To see more shots of Alexa and Ben’s big day, visit our Facebook fan page.